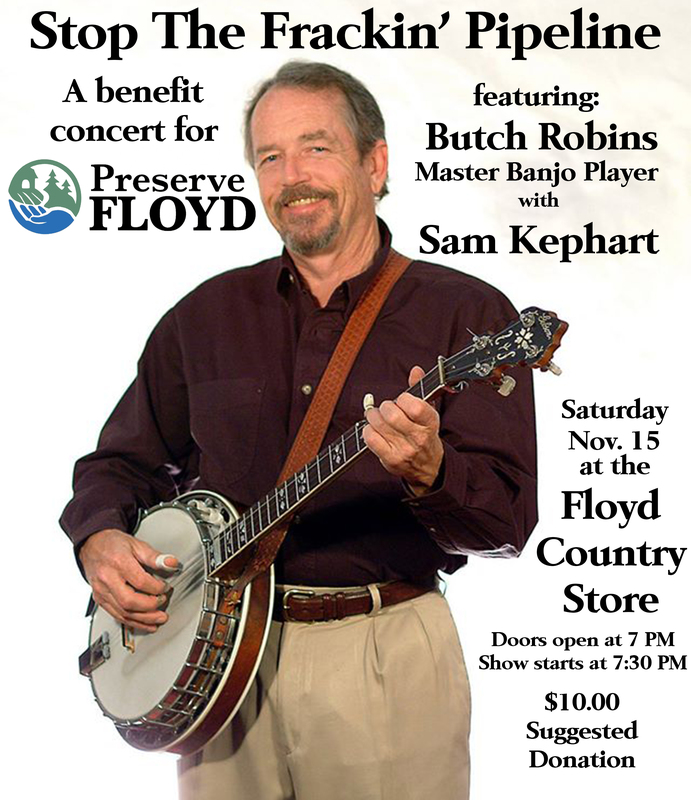 Join Preserve Floyd for a wonderful concert featuring master banjo player Butch Robins on November 15 at The Floyd Country Store. As one of the “Masters of The 5-String Banjo”, Butch has been playing and composing for over 50 years and shows no signs of slowing down! “Introverted master of an extroverted instrument”, Butch Robins, has established himself as an instrumental innovator and explorer. His banjo playing techniques have enabled him to share the sound of that instrument, and enhance the music of an extremely diverse range of musical stylists and definers of genre. Butch is a complicated man – an artist, a musician, a thinker and a storyteller. He’s a banjo player with few peers, and a chronicler of the music of Bill Monroe, the Father of Blue Grass Music. This will be a fantastic event with incredible music, community participation and your ticket purchases will be going to a great cause–STOPPING THE FRACKIN’ PIPELINE! Join us, bring your friends and neighbors and get ready for a really good time. October 14 –Joe Waldo, a lawyer specializing in eminent domain, will visit Floyd. You can come see him—and ask questions – at the Floyd County High School at 7 PM. October 28 at 7 PM – Representatives from EQT will be attending the Floyd County Board of Supervisors meeting. The meeting will be held at the Floyd County High School Auditorium. Between now and October 28, citizens are encouraged to come to the Floyd Artisan’s Market on Fridays from 5-7 PM to create signs, sing songs and practice for the spectacle we’d like to present to EQT as they roll into town. Want to learn more about fracking? Join us Sunday Sept. 28th at The Floyd Country Store for SustainFloyd‘s showing of the film “Gasland 2.” 6 PM for soup and salad supper, 6:30 for the film. Show up early if you want a seat–we’re expecting a big turnout. Come share with your neighbors the premier showing of a newly released, independent documentary about Floyd County’s precious water resources. The film titled “To the Last Drop” was created and filmed right here in Floyd, starring some of our local water experts. Fred First, Mark Sowers, Jeff Walker, Mark Grim, Lydeanna Martin, Dennis Dove and Jane Cundiff star in the movie and Bernie Coveney did the music. Professional videographers from Virginia Tech, Chris Risch and Grazia Apolinares produced this poignant movie that is not only educational but visually and emotionally inspirational. This premier showing will be presented for FREE at the Floyd EcoVillage on September 14 at 4:00. The event is being arranged and supported by Partnership for Floyd with hopes of getting good community involvement in preserving our streams, wetlands, and wells that are the source of life here in Floyd County. Lydeana Martin will introduce the documentary with pertinent and useful details about Floyd’s water supply. After the movie there will be a question and answer panel discussion with our local experts. Local songwriters Michael and Kari Kovick, and Erica Joy Rising will perform for us. Representatives from Citizens Preserving Floyd County will also be available to respond to questions about the proposed gas pipeline through our county and to describe how our water and wetlands could be affected. Information tables and handouts in the lobby will be available for those who want to learn more. Floyd fresh water, popcorn, art displays and good conversation will be enjoyed, all for free. Bring your neighbors, friends, school-age children and your questions. Join together for this community event to protect our precious, shared water resources in Floyd County. 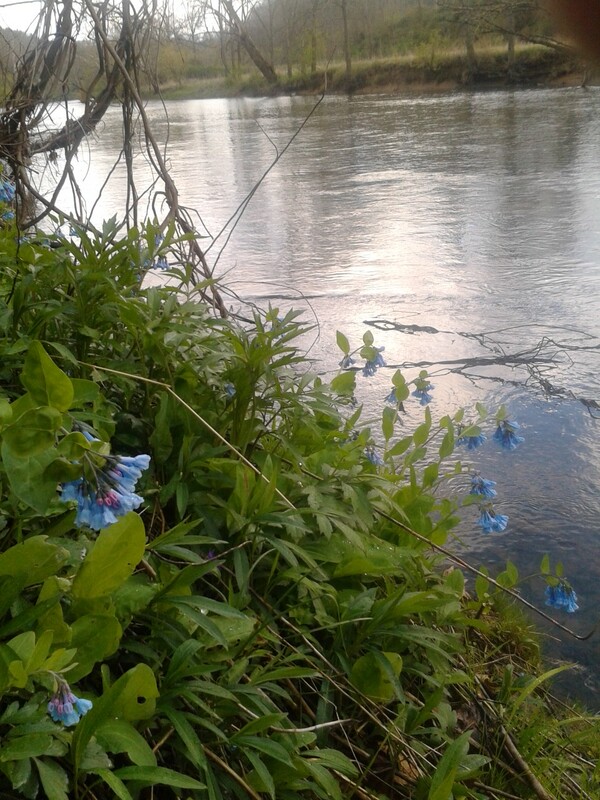 Local artists are invited to share their works related to water. Bring your paintings, crafts and photographs or have your children display their best water art for all to enjoy. Please email Jane Cundiff at PartnershipForFloyd@gmail.com if you have large pieces of art to display or for any other questions. A wonderful picture of Nahko and Medicine for the People holding our sign. The stories they told about pipeline projects, fracking and polluted water in many different parts of the country were heartbreaking and resonant. We’re grateful for the support and for all the connections we made at Floyd Yoga Jam.